← A journey of 4,956 miles begins with a single step…. Welcome to Arequipa! Now…where’s my luggage!? So after two months of preparation and building excitement, the Symantec Service Corps (SSC) team have finally arrived in Arequipa, Peru! Whilst everyone arrived safely, there were varying levels of transportation success. Whilst I arrived on time and in one piece, my luggage didn’t. Apparently it wasn’t keen on making the quick connecting flight from the US down to Peru and so decided to hangout in Miami for a few extra days. Whilst I’m all for doing your own thing, in this instance my bag left me in an awkward position. Two pairs of underwear, two t-shirts, a pair of shorts, two pairs of socks and a business shirt was only going to be enough to keep me operating for a couple of days (bearing in mind that half of the items had been worn for 24 hours of straight travel). Luckily for me, the bag decided to show up last night. It was a bit damp and I decided not to ask what it had been up to and simply welcomed its presence with open arms. 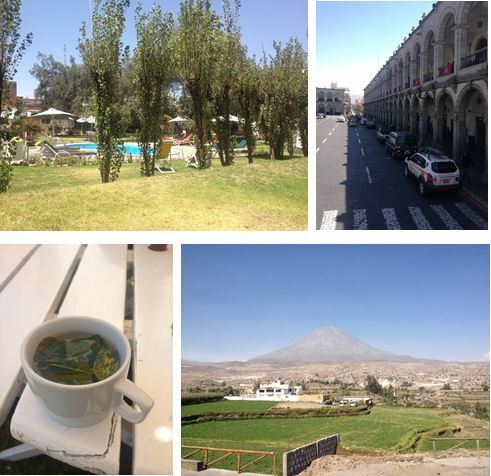 Settling in Arequipa has been pretty easy so far. Hotel Casa Di Me Abuela (translates to ‘My Grandmothers House’) is super comfortable and the staff there are really friendly. Being British, of course I have to mention how good the weather is. The local food also deserves a comment – especially the awesome Hamburguesa Alpaca!